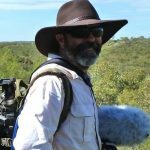 Steve Murphy is an ecologist with interests in threatened species recovery, fire management, Indigenous land management and ways to achieve good conservation outcomes in production landscapes. He is an Adjunct Fellow in the Centre for Biodiversity and Conservation Science, University of Queensland, as well as a University Fellow at Charles Darwin University. Steve also works partly as independent consultant, and partly as Threatened Species Science Fellow with Bush Heritage Australia. Steve lives with his wife Rachel on the Atherton Tablelands in Far North Queensland.